Got an idea for a brilliant product or new business? Wonderful. But how do you test it? It’s easy to get positive feedback from folk who believe in you but aren’t your future customers. Or to be dissuaded by others projecting their fears at you. Who are the right people to speak with? How do you find them? How do you have a meaningful conversation without folk lying to you because they’re polite? How do you get to the truth? And whether people really will buy from you? Holcroft develops “apps which makes a difference” – one has won awards for advancing patient safety. But it’s not all been plain sailing. After he left a well-paid city job writing software for an investment bank, he developed, launched and closed a startup selling a music education app. He’s frank about why this “worked as a product but failed as a business” and the key point he missed right at the start which is the reason it failed. But since then John, who has also developed apps for national retailers, pitched to and won investment and mentoring from the tech-for-good start-up accelerator Bethnal Green Ventures. He’s developed multiple apps for hospitals and the NHS. And he’s honed his research and interview skills. 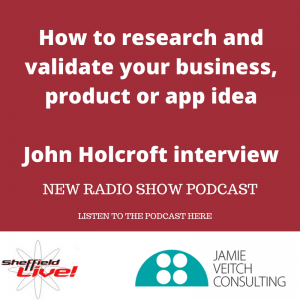 Listen to John and use his advice to get robust, genuine and meaningful feedback about your next product or business. Check out John Holcroft’s website.